The Arab World is a region that has been vastly misunderstood in the West. 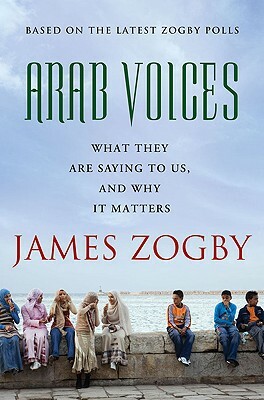 "Arab Voices" asks the questions, collects the answers, and shares the results that will help us see Arabs clearly. The book will bring into stark relief the myths, assumptions, and biases that hold us back from understanding this important people. Here, James Zogby debuts a brand new, comprehensive poll, bringing numbers to life so that we can base policy and perception on the real world, rather than on a conjured reality. * Despite the frustration with the peace process and the number of wars of the past few years, 74% of Arabs still support a two state solution to the Palestinian-Israeli conflict. And over one-third of Lebanese, Saudis, and Jordanians think that their governments should do more to advance peace. * Despite wars in and around their region and the worldwide economic crisis, when asked "Are you better off than you were 4 years ago?" 42% of those polled say they are better off, 19% worse off. * Arabs like American people (59% favorable rating), values (52%) and products (69%), giving them all high ratings. And Canada gets high favorability ratings everywhere (an overall rating of 55% favorable and 32% unfavorable). * However, Arabs overwhelmingly rate American society "more violent and war-like" (77%) or "less respectful of the rights ofothers" (78%) than their own society. Why? Because of the Iraq war and continuing fallout from Abu Ghraib, Guantanamo, and the treatment of Arab and Muslim immigrants and visitors to the United States. * What type of TV show do Saudis and Egyptians prefer to watch? The answer is, "Movies," which draws over 50% of the first and second choice votes. In Morocco, the top rated shows are "soap operas" and music and entertainment programs, drawing almost two-thirds of the first and second choice votes. Religious programs are near the bottom of the list of viewer preferences, garnering less than 10% of votes in all three countries. James Zogby is founder and president of the Washington, D.C. based Arab American Institute and a senior advisor to the polling firm Zogby International. He writes a weekly column that appears in twenty Arab newspapers and hosts a weekly call-in discussion program on Abu Dhabi television. A member of the Council on Foreign Relations, Democratic National Committee, and co-chair of the DNC's Resolutions Committee, he and his wife Eileen live in Washington, D.C."